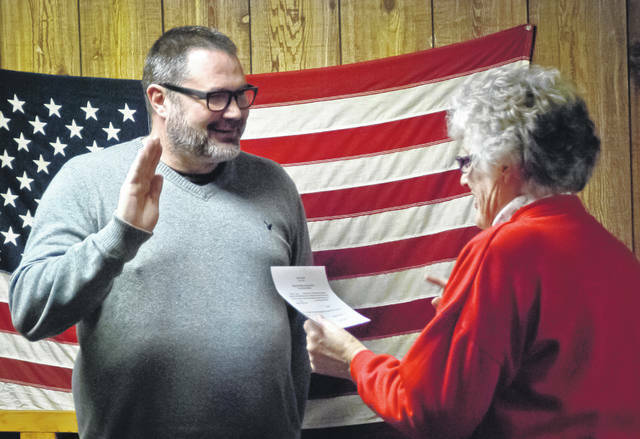 Dorothy Wilcox, Village of Ostrander clerk, right, thought it would be appropriate that Robert Taylor, left, stands in front of the U.S. flag hanging in the village hall to take the oath of office as mayor. Taylor had been serving as the interim mayor since the resignation of Larry Crile, former mayor, on Feb. 11. Robert Taylor and his family moved to the village of Ostrander in 2007, shortly thereafter, he started attending village council meetings. Monday evening (March 11) he was sworn in as mayor of the village. During council’s Feb. 11 meeting, Larry Crile, citing personal reasons, tendered his resignation as mayor. Taylor, 47, said he was originally appointed to council to finish someone else’s term. He said he has since been elected to two consecutive terms and served as council president for four years. Taylor said he will finish out Crile’s vacated term, which ends Dec. 31, 2019. Council appointed Chris Greasamar to finish out Taylor’s term as president, and the village is currently looking to appoint a new council member to fill the empty seat. In the months leading up to Crile’s resignation, Taylor said he had discussed it with him, so it wasn’t a surprise. Taylor added he has similar thoughts as Crile about the small village community that is now seeing an increase in development. Taylor said a lot of the people aren’t happy about it, but the village is close to downtown Columbus and growth is going happen. “We’re going to keep doing what we’re doing,” he said. Taylor grew up in Fremont, Ohio, later moving to Springfield where he graduated from high school. He then attended Ohio University, where he obtained a civil engineering degree. Taylor said it was his wife who found the house in Meadows of Mill Creek where they live now. Taylor said he left ODOT five years ago and went to work for the City of Dublin as the infrastructure asset management engineer.